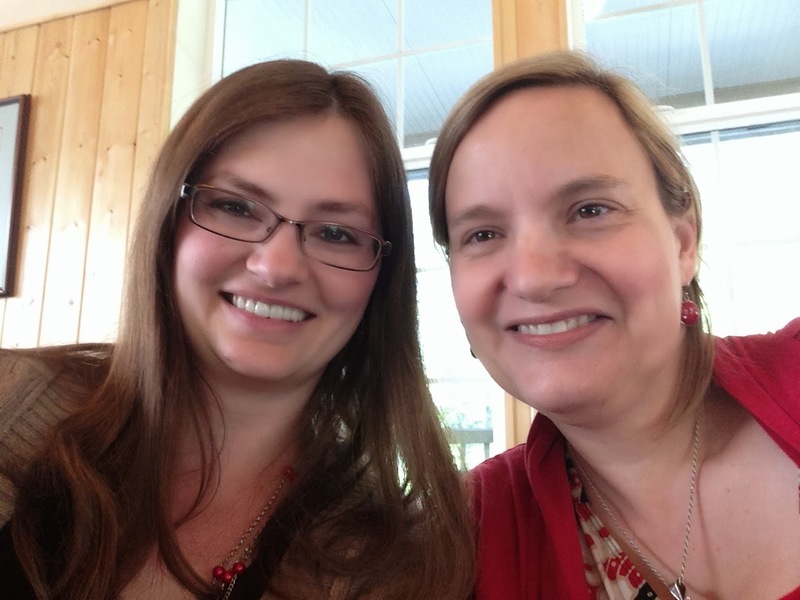 Last weekend I attended a women's retreat over in the Seattle area, Northwest Pilgrims. I literally had not met a single soul there, though I'd conversed with one online. For introverted me it was pretty scary to walk into that first room, but I had such a good, rejuvenating time! Great discussions, time to myself to write, a beautiful setting on the west side of Hood Canal, a few of us even snuck off one night to watch The Avengers: Age of Ultron. I met some amazing women from all walks of life and feel honored to have heard their stories. Can't wait for next year! And I got to finally meet the fabulous Jana Riess in person! I adore her book Flunking Sainthood and The Twible's pithy tweetables on each chapter of the Bible make me laugh. She also has a new book out called Flunking Sainthood Every Day: A Devotional for the Rest of Us that I'm excited to dig into. And I never miss a blog post of hers; they're always insightful. 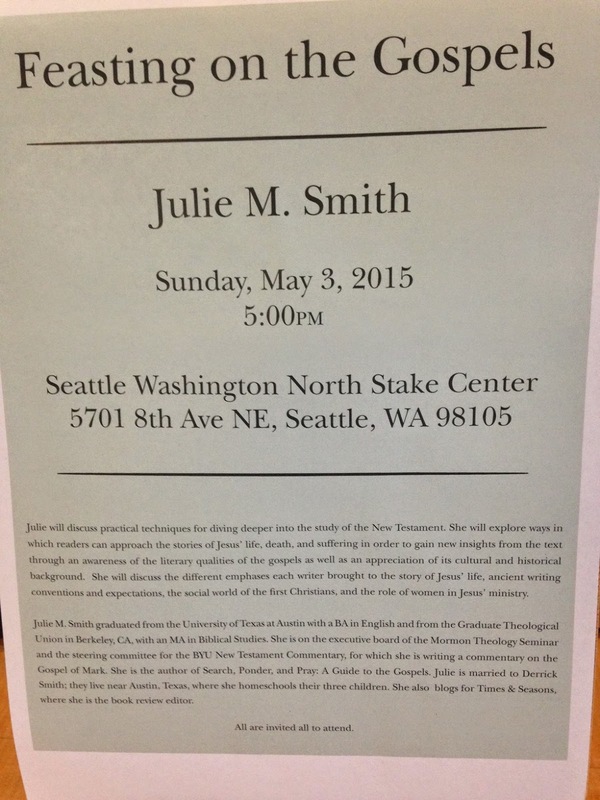 The retreat ended by 1:00 on Sunday, but I heard that the amazing New Testament scholar Julie Smith was giving a fireside at the Seattle North Stake Center at 5:00, so I had to stick around for that. She blogs at Times and Seasons and I find her pieces thoughtful and thought-provoking without fail. She recently released the second edition of her study guide for the Gospels titled Search, Ponder, and Pray, which I'm slowly working my way through. The interesting aspect of this study guide is that it almost entirely consists of questions. Julie uses her vast knowledge of the New Testament to help draw connections between Old Testament scriptures and New, to point out alternate interpretations of the Greek, to encourage reflection and personal application. She draws in parts of the Joseph Smith Translation, too. It's hands-down one of the best tools for immersion into the Gospels I've ever seen. 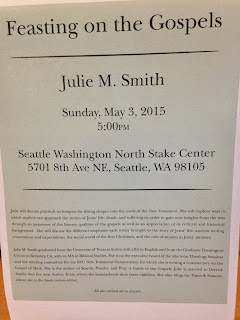 And seriously, why does Seattle North Stake get all the cool firesides? Just for fun, here are "15 Insanely Useful Diagrams for Book Lovers". I liked #5 - helping you determine which Shakespeare play to read next - and #7 - what to read after Jane Austen. And #12 - a guide to selecting diverse picture books for your kids. And #14 - how readers make the world a better place. Yeah, I really like that one.